So our latest adventure has brought us to “Brushwood Folklore Center,” for two weeks of pagan festival filled with ritual, connection, and teachings of love. The freedom experienced here in self-exploration, expression, and ancient wisdom, does require a certain amount of ‘openness,’ that you might not readily find in common spiritual paths of healing. Walking the grounds visiting carefully constructed shrines, attending involved workshops on various topics in pagan practices, creativity, and lore, we find ourselves deeply involved in rich opportunities for further self-realization. Many of our neighbors frequently walk the grounds enjoying the option of wearing only their bare skin, smiles, and body parts dangling freely as they move. Although I’m unaccustomed to this lifestyle, its easy to find yourself quickly adjusting to the possibility of sharing showers, eating meals, and a good conversation about whatever may pop up ? in the safety of this community. Each day brings a revelation of peaceful coexistence with body, mind and spirit, in surprisingly humorous ways, like this mornings class on healing through ritual love, when our instructor asked if this retreat was still clothing optional upon showing up for her class, then proceeded to strip down to nothing while teaching. So we learn, more about ourselves daily, each other, the earth, and our humanity. 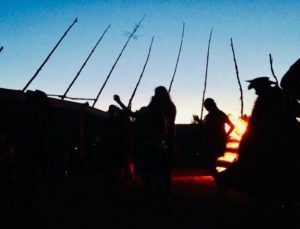 Nightly bonfires are accompanied by music, stories, and conversations, eventually drowned by the tribal drumming that reminds us of our rich journey over thousands of lifetimes, to this present cycle in reclaiming our heritage. Brushwood has given us something, an old dimension to the awakening that seeks to be acknowledged in all of us, the freedom we wish to express, to be ourselves, stand in our truth, and speak in love for the fulfillment of parts coming forth to be heard. May we love, with all the ferocity of the old gods, dance to the fires within us, and live what we have come to live.